We live surrounded by elements in the environment linked to cancer. According to President Trump, we can now add yet another dangerous carcinogen to list: windmill noise. However, luckily for us the windmill cancer link like so many other things uttered from the mouth of Donald Trump, is completely made up out of thin air because no such link exists. 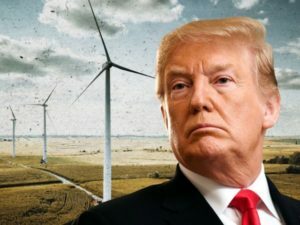 We all know that ever since citizen Trump lost his standoff with the government of Scotland over windmills he did not want marring the views from his Trump International Golf Course, Trump has had a personal vendetta against windmills. He has repeatedly publicly grieved for the number of birds killed by wind turbines each year (estimates vary between about 150,000 – 300,000 per year in North America) but given that this is a relatively tiny number in comparison to the number of birds killed annually by radio and cell towers (6.8 million), his plea to end the plight of avian victims at the hands of evil windmills failed to resonate. Let’s be sensible and realize that Trump does not really love coal and coal miners as much as he constantly expresses it. What he loves about coal is the generous campaign donations and staunch support he receives from Murray Energy (the company that supplies most of the coal for Paradise #3) CEO, Bob Murray. Thankfully for our environment, the TVA voted 5-2 in February to close the plant despite Trump’s objections.